The Yukon River originates in British Columbia, Canada, and flows through Yukon Territory before entering Alaska. In southwestern Alaska, the Yukon Delta spreads out in a vast tundra plain, where the Yukon and Kuskokwim Rivers meander toward the Bering Sea. The Enhanced Thematic Mapper Plus on the Landsat 7 satellite acquired this natural-color image of the Yukon Delta on September 22, 2002. Looking a little like branching and overlapping blood vessels, the rivers and streams flow through circuitous channels toward the sea, passing and feeding a multitude of coastal ponds and lakes. The Yukon Delta is an important habitat for waterfowl and migratory birds, and most of the protected refuge is less than 100 feet (30 meters) above sea level. Over such low-lying, mostly treeless terrain, the rivers can change course frequently and carve new channels to find the fastest route toward the sea. 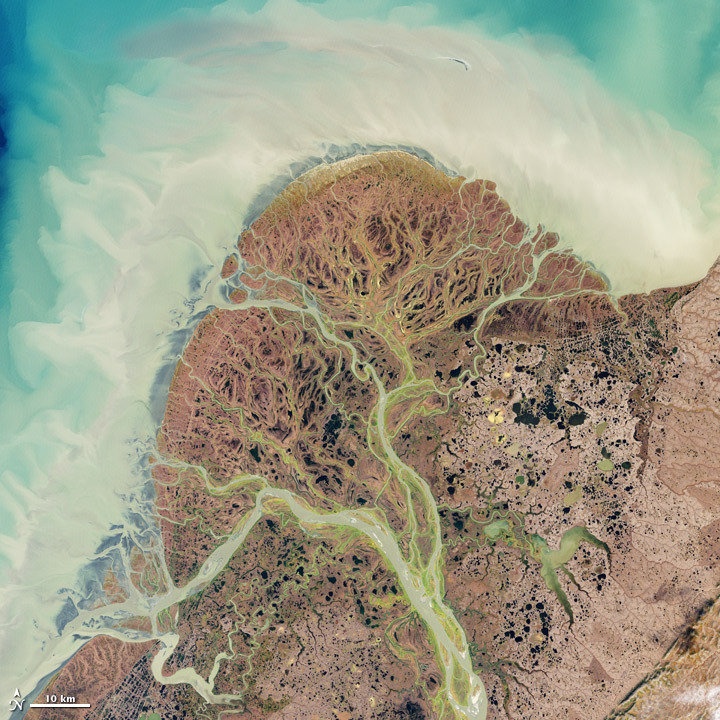 The pale color of the sea water around the delta testifies to the heavy sediment load carried by the rivers. 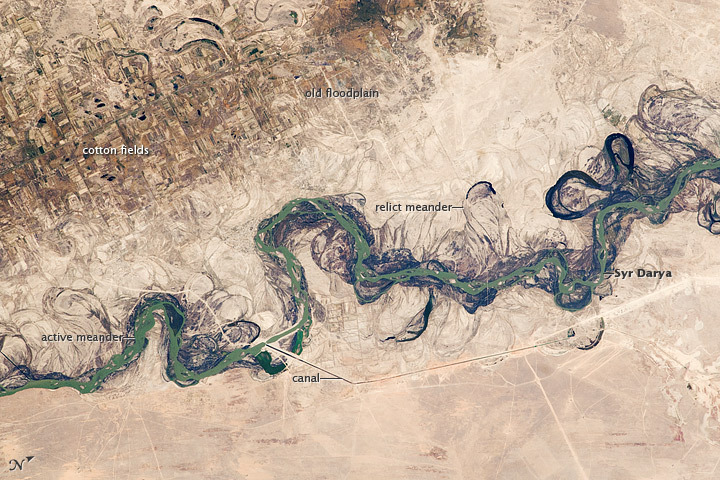 Beautiful pictures from NASA EOS showing paleo and historic river meanders in the floodplain of the Syr Darya River in Kazakstan. The floodplain is shown here as a tangle of twisting meanders and loops (image center). The darkest areas are brushy vegetation along the present course (filled with blue-green water); wisps of vegetation are also visible along flanking swampy depressions, or sloughs. An older floodplain appears as more diffuse dark vegetation (image upper left), where relict bends are overlain by a rectangular pattern of cotton fields. The straight channel of a new diversion canal—one of 16 from this point downstream—can be seen along the east bank of the river. The older floodplain is fed from the Chardara Reservoir, immediately upstream (not shown).